The internet is the great equalizer that can allow small companies to compete well in the international arena if done correctly. As in the USA, search engines are by far the top place people find and research products and services. Here are some things to know when targeting search engines in other countries. The top search engines vary from country to country. In China, it’s Baidu. In Japan, they favor Yahoo Japan. In Russia, Yandex is the big SE. Research this so you know what search engine optimization is best for your website to succeed in the country you wish to target. As German Chancellor Willy Brandt famously observed; “If I am selling to you, I speak your language. If I am buying, dann müssen sie Deutsch sprechen”. The same applies to successful international internet marketing. This goes beyond shoving up a page with some quick and dirty translation under your website. Your copy needs to be well translated with natural language flow and idioms. Keyword research in the targeted language must be performed and optimized into the site. The easiest approach for a foreign language website is a subdomain. To target Spain, for example, set up a Spanish language website at espana.[yourwebsite].com. The best method, however, for serious international search engine optimization is to register a domain under the ccTLD for the country you are targeting, for example www. [yourwebsite].es in Spain. This is highly recommended for countries where Google and Bing are not the top search engines. Be aware, though, that to register some country extensions, a registered business entity and/or physical business address is required in that country. Google considers geographic locations of the website hosting in their ranking algorithms so hosting the website in the country you are targeting is recommended. It is easy, with a credit card, to purchase hosting from an overseas hosting outfit. Make sure you research for reliable hosting first before you sign up. Use local contact addresses where possible. These will get indexed and help the search engines identify you as a legitimate operation in the targeted country. Use local stories, images, currencies and measurements. If you are shipping product, be sure to address international shipping considerations, or set up local distribution. Esthetics Design, images and color must also be thought through. Colors have strong cultural connotations. Be sensitive to this in your website design. Orange is the color of mourning in Egypt. In China, green is associated with infidelity! 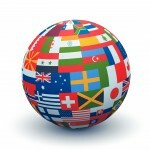 Good international internet marketing can be your cheapest route to doing business overseas. But do it right! Feel free to use our file sharing site!